Cantilever Racking is an ideal solution for storing your long irregular and awkwardly shaped products. It is available in both single sided and double sided lengths. 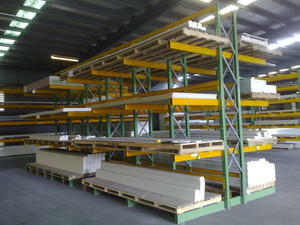 Cantilever Racks allow for quick and easy stock placement. Examples of products stored are; long and awkward steel and timber lengths. The system is Aus Made/Manufactured and comes with a full life time warranty, and meets all A.S4084-2012 Standards. Cantilever racking is custom built to suit your products and materials individual sizes and weight loads.